This soup is so simple and delicious! Tastes just like the kind they serve in restaurants too. This will also make your kitchen smell so wonderfully delicious. The trick to make this taste so amazing is to let those onion slices slowly simmer in the butter mixture for at least 30 minutes. This will allow the onions to caramelize and bring out those wonderful flavors. I used slices of french bread layered with Swiss and provolone cheese. 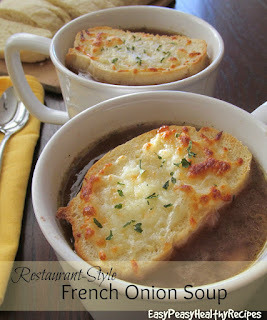 But you can easily substitute sliced baguettes and different kinds of cheeses like gruyere. Hope you enjoy this wonderful comforting soup recipe! 1. Melt butter in a large soup pot over medium heat. Cook and stir onions, garlic, salt, black pepper, and thyme until onions are soft and brown, about 30 minutes. Pour in red wine and sherry; bring to a boil. Reduce heat to low and simmer about 15 more minutes. 2. Sprinkle onion mixture with flour and stir until coated; cook for 10 minutes. Pour in broth, stir to blend in flour, and simmer until slightly thickened, about 20 minutes. 3. Ladle soup into 4 oven-safe serving bowls. 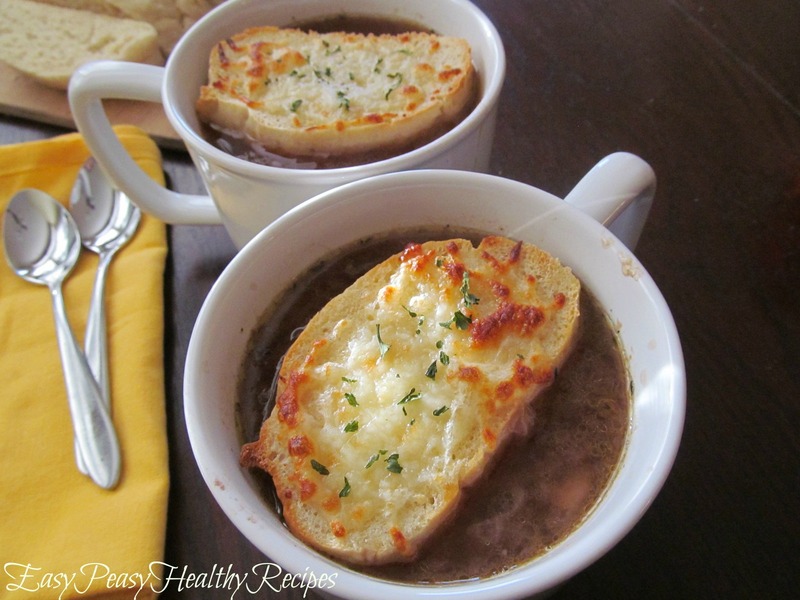 Place bread slices into the bowls and top each with a slice of Swiss cheese and a slice of provolone. Carefully place filled serving bowls onto a baking sheet. 4. Broil soup until the cheese is browned and bubbling, 3 to 4 minutes.